Did you know you can travel green all the way from Oslo to (and around) Flåm? 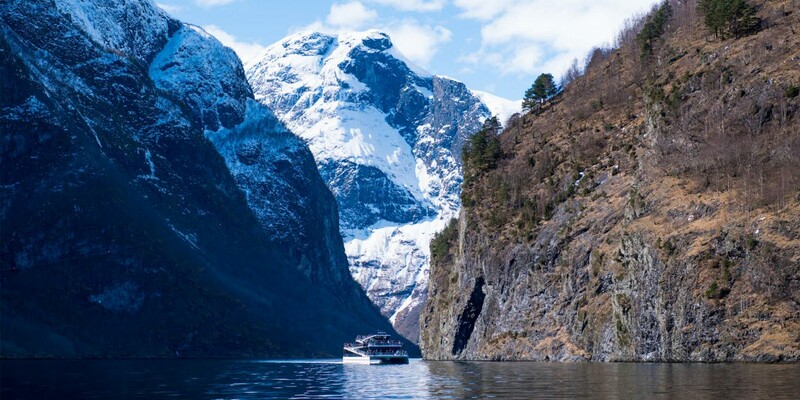 And that Flåm has two award-winning vessels, one hybrid and one fully electric that sails through the UNESCO-listed Nærøyfjord? Learn more about how Flåm facilitates eco-friendly tourism in the area, enabling you to travel greener. There has been a shift in the focus of people and businesses when it comes to being aware of looking after Mother Earth. Fortunately. Tourist businesses have a responsibility when it comes to focusing on reducing their impact on our planet and being innovative when further developing destinations. To facilitate sustainable experiences, Flåm has invested heavily in making it easier for visitors to make greener choices when visiting the area. “Vision of The Fjords was an important development for us but we wanted to take it one step further and replace diesel-electric propulsion with all-electric propulsion – thus eradicating all noise and emissions into the air along the entire route. 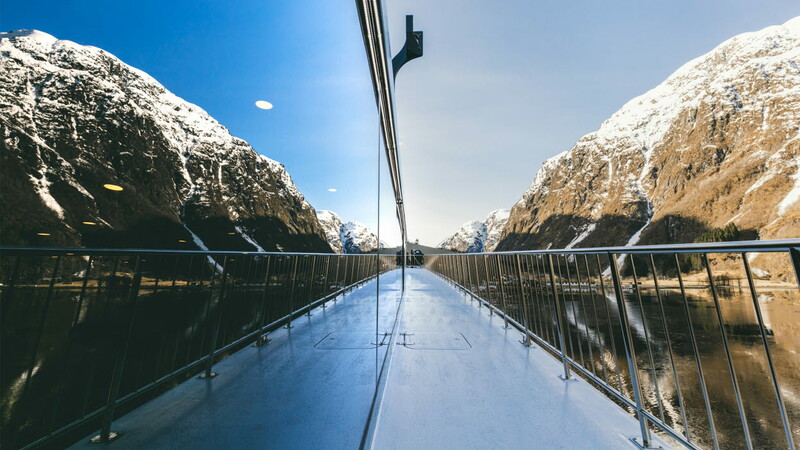 Future of The Fjords does just that, minimising its environmental impact while maximising the passenger experience. 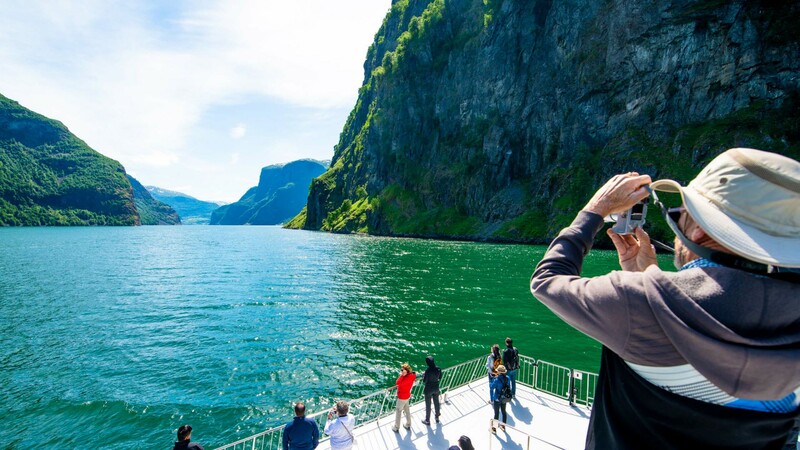 Passengers can now glide silently over the water and get closer to nature than ever before”, states Rolf Sandvik, CEO of The Fjords. "Really, is it? So that’s why it’s so quiet! That’s amazing," said Lee. "This boat is phenomenal. The fact that it’s all-electric really made a difference to us when we were selecting a boat trip. This is because you get to hear more of nature, you hear the water, you hear the wind and you hear the seagulls flying by," explained Katie. "You don’t even realise you're on a boat. It feels like you're just floating on the water because you don’t hear it," added her husband, Ben. Not only are there two environmentally-friendly ships awaiting you in Flåm. A great tip if you want to give your feet a rest and relax your body is to rent an electric e-mobility car and explore the area. These fun cars let you cruise around without making any impact on the environment. 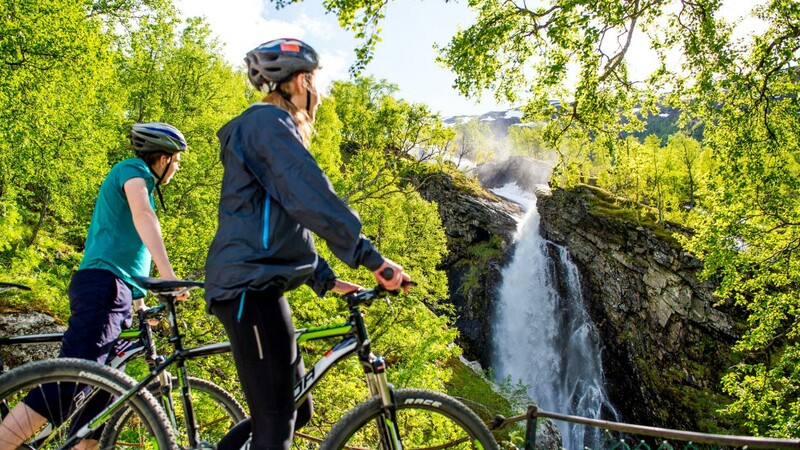 In Flåm, hiking, biking and kayaking are popular activities for visitors who want to be active and explore the nature. Besides, exploring the mountains and nature around Flåm by foot or saddle will help you find those hidden gems! There are plenty of lush landscape, idyllic valleys and spectacular views. You can rent bikes in both Flåm and Myrdal (the last station on the Flåmsbana/Flåm Railway). A trip on the electric Flåm Railway to Myrdal, described as one of the most beautiful train journeys in the world, is an attraction in itself. A spectacular trip that, for good reason, is one of Norway’s most popular tourist attractions. 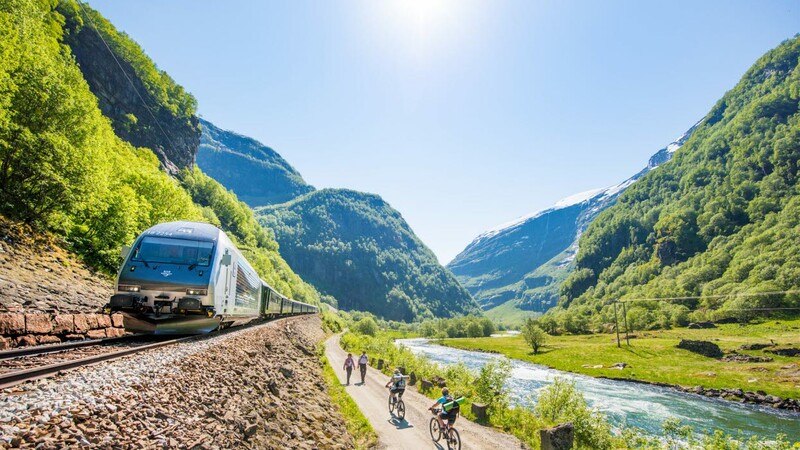 Combining the train ride with a hike or cycle ride down from Myrdal to Flåm through the verdant Flåm valley is the ultimate combination, if you can spare the time. So how do you get to Flåm in the greenest possible way? Getting to Flåm from Oslo and Bergen by train is both eco-friendly and the most trouble-free method of travel – since the Bergen Line (Bergensbanen) from Oslo to Bergen connects with the Flåm Railway in Myrdal. In any case, the train ride is a spectacular journey through the Norwegian landscape. The train journey from Oslo to Myrdal takes around 4.5 hours, and the journey from Bergen to Myrdal takes around two hours. From Myrdal you can travel to Flåm on the Flåm Railway. The train journey from Myrdal to Flåm takes you from 867 metres above sea level to 0 metres above sea level within one hour and will certainty give you a breathtaking experience. Stay in eco-friendly hotels. 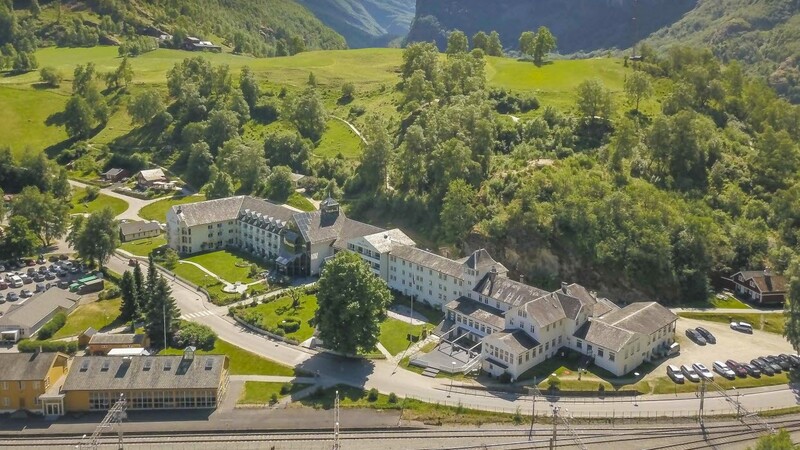 Fretheim Hotel in Flåm is a certified Eco-Lighthouse hotel, meaning the hotel can document its environmental efforts and demonstrate social responsibility. Enjoy locally-produced food: Fretheim Hotel, Toget Cafe and Flåm Bakery all serve and sell local products. This is better for the environment, you are supporting local farms – and besides, the food is fresher and tastier! Bring a reusable water bottle with you. The tap water in Norway is excellent! Say no to plastic. Bring a rucksack. Do your back a favour, too. Don’t drop litter! Nature is precious, so let’s take care of it. Are you on a low budget? Camp outdoors! Norway has an “Outdoor Recreation Act”. The purpose of this Act is to: "protect the natural basis for outdoor recreation and to safeguard the public right of access to and passage through the countryside and the right to spend time there, etc, so that opportunities for outdoor recreation as a leisure activity that is healthy, environmentally sound and gives a sense of well-being are maintained and promoted".